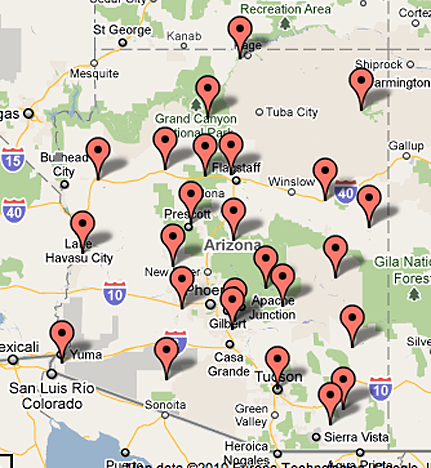 There are 25 USHCN stations in Arizona and, according to Chiefio’s list , there are two GISS stations at Phoenix and Tucson. So the first step is to download the individual station data. And I find the first interesting little conundrum. 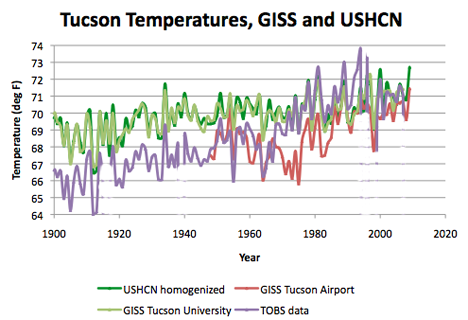 There are two sites for the GISS data for Tucson, but one runs up to 2008 (at the University) while the other only starts in 1946, at the Airport. It is not difficult to decide which is the more likely candidate, given the custom that we saw in earlier states of the GISS practice of marrying a long-term station with one that did not start until the late 40’s. This would argue for GISS using the airport data, rather than the University, particularly since the University data stops in 2008. 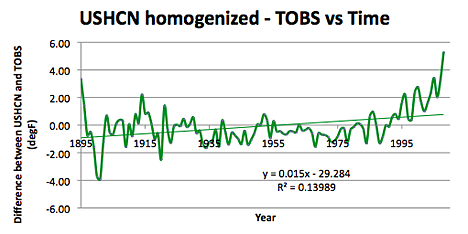 The University one shows the high temperature in 1934, the Airport set, not existing then, does not. 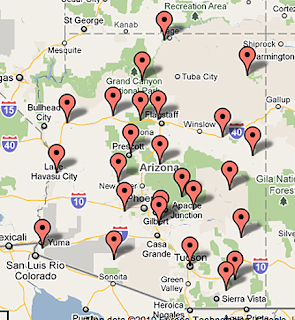 However perchance Tucson also shows up on the USHCN list, one of the few to share both, and that site is the University one. So I am going to put both sets in and then see what the plots indicate. First, to indicate how the change in the Tulsa affects the intepretation. 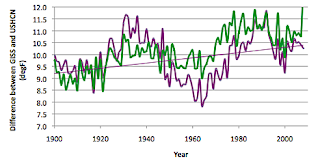 Consider if we subtract the USHCN average from the average of the likely GISS combination (Phoenix and the Tucson Airport), shown in purple, as against the longer record of the Phoenix plus Tucson University average, shown in green. Subtracting the USHCN average from the GISS averages, using either the Tucson Airport GISS (purple) or the University data (green). 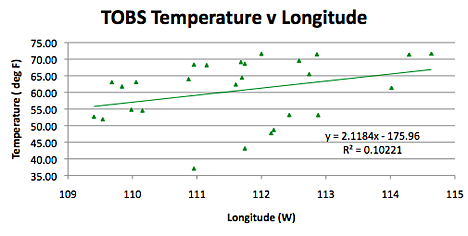 Because the two cities are not only large, but at a lower elevation than much of the state, the difference in either case between the average state temperature shown by the USHCN network and the GISS stations is about ten degrees. 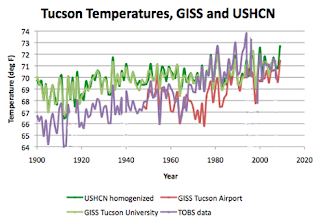 When I look t the four versions of the Tucson temperature, there are some slight differences between the GISS and the USHCN (the two greens) even though they start, supposedly, with the same information. And the TOBS is quite different, as is the GISS Airport. Well, let me move on to putting in the populations, and then I can start doing the conventional comparisons. The Canyon de Chelly station is at the Visitor Center to the National Park, and near the building, so perhaps I can put in a value of 10 for population. Similarly the site at Childs has only one building near it, though it turns out (using a photo nearby on Google Earth) that it is a “power house.” And those I was giving a nominal value of 100 to. Fort Valley, after another Google Earth look, is on the outskirts of Flagstaff, whose population I used, since development has reached the station. Lees Ferry is a trout hatchery and a campground, so another SWAG at a population of perhaps 50. (The problem with these is seasonality). And the rest come largely from citi-data about the individual communities, with a couple where a slightly longer search was needed. 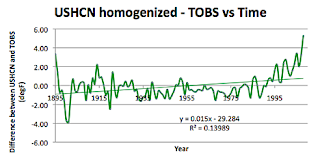 So what do we have, switching now to the TOBs data for the state? What is interesting is the shape of the curve, relative to the continuously rising plots seen so far. 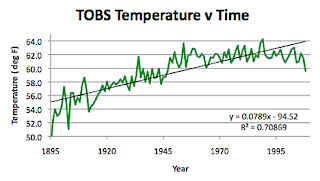 The raw data for the state would seem to suggest that the average temperature has been relatively constant for some time. In terms of the impact of the state geography etc on the temperature, Arizona runs from roughly 109 to 115 deg W in Longitude, and 31.3 to 37 deg N in latitude. It is 400 miles long and 310 miles wide. 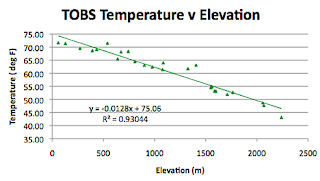 The highest point in the state is at 3,850 m, and the lowest is at 21 m. The mean elevation is at 1,250 m. Note that the average station height is at 1,061 m and that the two GISS stations are at 330 and 742 m (Phoenix and Tucson). For Longitude there is also a correlation, but note that it goes the other way to that of other states, and as with them may be tied more to the subsequent plot of elevation. The plot of elevations is another case where this is very well correlated, as we saw with some of the other states on the other side of the country. It is worth noting that this is likely over one of the larger ranges of elevation changes that we are likely to see. 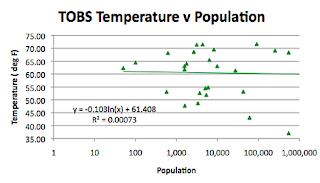 There is not much correlation with population, and I don’t think that the few stations that I made a guess at (the ones on the left) made that much difference. From time to time there are reports that Arizona has been hitting much higher temperatures that the rest of the country, and higher than the historic past. Yet the TOBS time curve does not show that, in recent years. Perhaps this plot might explain why those announcements can be made.